In the past year, we logged about 2500 community service learning hours at Chucalissa. The hours are primarily attributable to AmeriCorps NCCC Teams. We also worked with a host of other service learning groups including State AmeriCorps teams and alternative spring break students from throughout the Midsouth. In addition to a considerable amount of collections work, over the past two years the NCCC teams completed a host of other projects at Chucalissa. For example, they conducted a shovel test program in the “meadow” area of Chucalissa to determine if there were any intact archaeological deposits. They expanded the community garden that had outgrown its original bed. Over a one year period, three different AmeriCorps Teams worked on successive construction phases of our replica Mississippian house structure. This past fall, a team built a 30 x 30 foot pergola so that we could have a covered shelter for outside activities. They also built a rain structure along our nature trail. AmeriCorps Teams are the best when it comes to clearing and refurbishing trails, and then have done a good bit of that at Chucalissa too. In 2007, the University of Memphis and by extension Chucalissa, had a less than stellar reputation in the Westwood community of Memphis, the location of our Museum. Area residents were concerned about the stench from the sewage treatment plant, code violations, and crime rates. The community perceived the University interests as research from which the University made money and faculty gained prestige but with little or no relevance to the community. As one resident stated at a community meeting I attended in 2007 “Don’t tell me what the University of Memphis is going to do for my community. The last time you were here doing your research for two years and all we got was a map on the wall.” The man was right. That brings us to another part of AmeriCorps work at the C.H. Nash Museum. Since 2007, the C.H. Nash Museum staff began to reconsider our role as an educational resource of the University of Memphis. Now, a central focus of the Museum since 2007 is to engage the surrounding community in all aspects of Chucalissa’s activities. The engagement flowed from the museum’s commitment to begin functioning as a social asset and stakeholder in the Southwest Memphis community. Over the next four-year period we participated in many collaborative and co-creative projects with the surrounding community (detailed in this article). In 2012, through a partnership with T.O. Fuller State Park and the Westwood Neighborhood Association, we proposed a 3-way partnership for an AmeriCorps NCCC Team. Over an eight-week Round, we proposed that the Team would spend about one-third of their time working at T.O. Fuller State Park, one-third of the time working in the community, and one-third of their time working at Chucalissa. 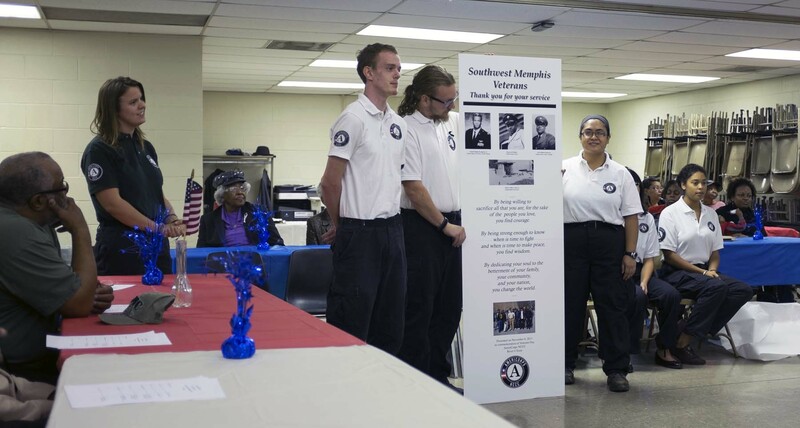 The University of Memphis put a good bit of money and labor into rehabbing a residential facility at the Museum to house the AmeriCorps Team. 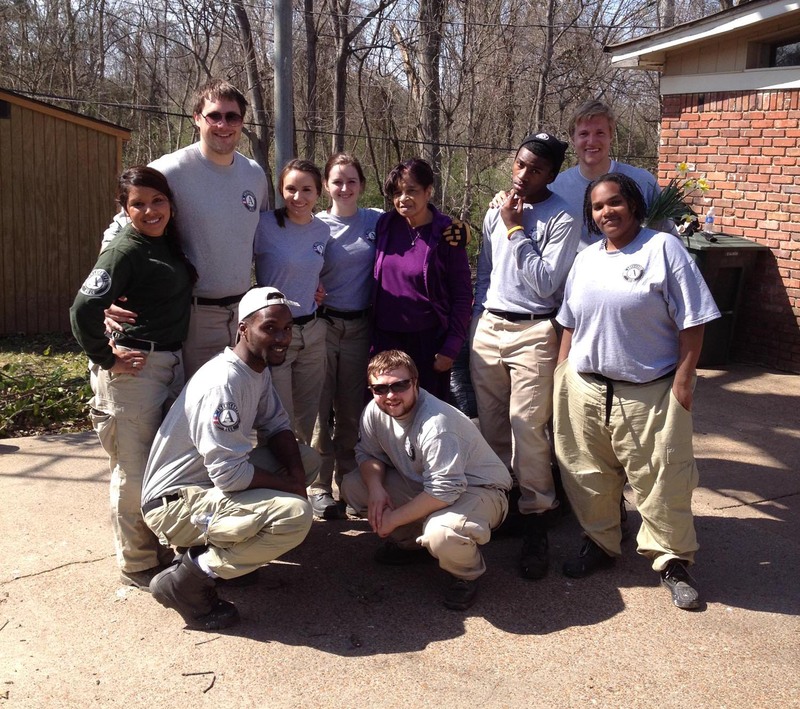 In the past two years, we have hosted four eight-week AmeriCorps Teams. In the Westwood Community, modifying John Cotton Dana’s 100-year-old suggestion, we sought to “Learn what aid the community needs: and fit the Museum and AmeriCorps to those needs.” Those needs focused on working with the elderly and veterans on fixed incomes to correct code violations or perform minor to moderate structural repairs on their homes. For example, in the fall of 2013, the River 4 AmeriCorps Team performed an exterior makeover to the home of an 88-year-old WWII Veteran in the Walker Homes neighborhood, a community established for returning African-American veterans in the late 1940s. Mr Ford Nelson, the Veteran homeowner, had lived in the house for 60 years. AmeriCorps Team presenting Veteran’s Day Banner at the Westwood Community Center. A highlight of each AmeriCorps Team is their participation with the community in a Day of Service, whether on 9/11, Martin Luther King Jr. day, or Youth Services Day. This past November, the River 4 Team presented a banner they created honoring veterans at a Veterans Day event at the Westwood Community Center. The presentation was a BIG deal. Here is how this all comes together. The AmeriCorps Teams provide the Westwood neighborhood with a community service that they desperately needed and wanted – correction of code violations and housing rehabs. The AmeriCorps Teams also are instrumental in allowing the C.H. Nash Museum to engage with the community in cultural heritage projects. This intersection is reflected by Mr. Ford Nelson, whose house the AmeriCorps Team worked on in November, attending and speaking at the Black History Month event hosted at Chucalissa in February. This intersection also allows the President of the Neighborhood Association to be a strong advocate and participant in the planning for Hidden Histories cultural heritage program collaborations between the community and Museum for the summer of 2014. That sentiment is a critically important part of the AmeriCorps experience at Chucalissa. In 1986, during my first archaeological field experience, the instructor, the late Dr. Patricia Essenpreis told us on the first day “If you cannot explain to the visitor why their tax dollars should go to support these excavations or keep this site open, you might as well go home.” I puzzled over this mandate for many years. Today, I find the mandate comes down to being relevant. The AmeriCorps experience is part of our Museum’s relevance to the communities that support us through their time, energy, and resources.